Senior Emilia Schempp’s journey at Southeast has her attempting the improbable — balancing both sides of the brain as a double major in physics and dance. There were many factors that drew the Normal, Illinois, native to Cape Girardeau, but the main reason for her choosing Southeast as her place of study was the ability to pursue both degrees. Many larger universities were not keen on the idea of her studying both at the same time. The cost differential appealed to her as well. The dual degrees Schempp is pursuing is a Bachelor of Arts in dance and a Bachelor of Science in physics. Along the way, Schempp has received guidance from two advisors at Southeast, assistant professor of dance Hilary Peterson and professor of physics Margaret Hill. Looking to combine her two majors in some capacity, Schempp is doing research with Hill on the physics of dance. Currently they are examining friction between dancer’s shoes and the marley floors they perform on. Another way Schempp is looking to connect the two worlds is by studying the contact forces dancers encounter when leaping or coming down off pointe. They plan to analyze the coefficient of friction between the marley floor in studios and on stage and dance shoes. Variables to the research could be pointe shoes compared to flat shoes, and how the floor’s surface can be manipulated. Schempp already has completed a project involving the two, as she teamed with professor of physics Michael Cobb to develop a poster on the physics of dance. “We had a photoshoot and everything and he drew all the force vectors and analyzed different dance movements through the eyes of physics,” Schempp said. 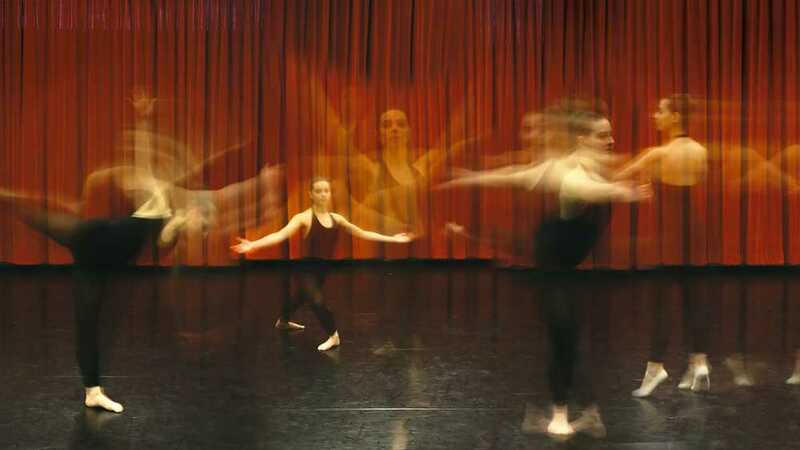 After bringing dance to physics with the assistance of Cobb, Schempp looked to bring physics to dance when tasked with a choreography class project and given the freedom of her imagination. She chose five dancers and looked to create a piece that portrayed Newton’s Cradle, with the five hanging mass pendulums. This semester, Schempp wants to continue the same idea and see what else she can do. Having to split senior-level coursework between the River Campus and physics department has pushed the boundaries of time management for Schempp, but with a tight schedule and a passion for both, she has found a way. A great deal of Schempp’s success comes thanks to her time management skills and supportive faculty. Her professors recognize she is committed to both majors and doing everything to her best on both fronts. Her passion for both fields shines through to her professors, and they try to work with her as best as possible. Because of the unique nature of her two majors, Schempp claims she feels like an outsider at times. Her physics friends don’t seem to understand she still has shows and rehearsals after they are done with a unit of physics. On the other hand, her dance friends don’t understand she has homework to do every night, including the weekends, and that she has to study to maintain good grades and understand what is going on in her classes. “Understanding, for other people, what goes on in my life is hard,” Schempp said. For others, they realize the amount of work Schempp does and recognize it. What has impressed Hill about Schempp is her ability to tackle a male dominated field while maintaining her femininity. On the dance side of things, Schempp feels most proud to have been in every dance concert production since she has been at Southeast. Of her favorite productions, 2017’s Fall for Dance production tops the list. As she prepares for graduation in May, Schempp is looking to get into a graduate program where she can combine both her interests, likely in a biomechanics field of study. On her list of possible graduate schools is the University of Madison-Wisconsin, the University of Michigan-Ann Arbor, the University of Arkansas, ISU and her most likely choice, the University of Memphis. Although her focus is on her studies post-graduation, Schempp has not ruled out continuing performing. Regardless of where she ends up, Schempp knows there is a balance that she will need to find. And if there is one thing she can do, she can certainly find her balance.